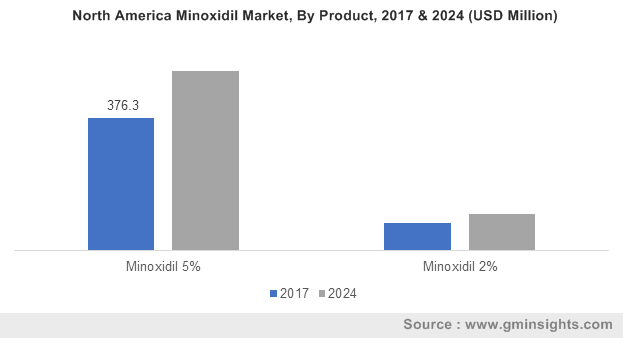 Minoxidil Market size valued at USD 880 million in 2017 and will witness over 100 million units demand by 2024. Growing demand for hair loss treatments owing to the increasing count of people witnessing pattern hair loss will propel the minoxidil market demand. Changing lifestyle pattern, adoption of hectic schedule has increased stress levels, which in turn resulting in frequent hair loss among at earlier stage among the young population. Occurrence of androgenetic alopecia or pattern hair loss in men and women instigating demand for topical drugs such as minoxidil and finasteride. American Hair Loss Association (AHLA) reported that more than 95% hair loss is caused by Androgenetic Alopecia. Also, around 35 million men and 21 million women from 35 and above age group are currently suffering from the hair loss symptom. Surging consciousness among consumers for the hair regrowth & nourishing through the damage preventing benefits projected to boost industry growth. In addition, increasing geriatric population ratio in several countries stimulating demand for mild & topical hair repair tonics to minimize side effects will enhance the minoxidil market penetration. Ocurring health issues such as depression, arthritis, hypertension, cancer, and cardiovascular diseases need a substantial medical dosage which in turn resulting in significant hair loss among the patients. Cancer treatment procedures, including chemotherapy and other drug treatment directly impacting hair damage which will enhance the minoxidil market growth. Factors such as unidentified nature of hair loss due to environmental impact, diversity of hair substrate, regular dietary pattern, and daily habits may complicate the potential customer identifying process. However, it may provide ample opportunities for companies to produce a versatile product mixes incorporating a wide range of specialty ingredients. Manufacturing companies are investing extensively to incorporate the use of novel oils in combination with minoxidil in the form of emollients and lotions. The addition of botanical and herbal formulations offers tangible benefits in each product drawing strong attention in the market. Slight challenges are witnessed by companies with respect to bulk production owing to the consistently growing demand for these hair care products over the last decade. Therefore, manufacturers are outsourcing to a pharmaceutical compliant for the minoxidil composition. They prepare using correct formulation, equipment, and technology that can be implemented for global scale production. Increasing use of non-invasive treatment is another factor supporting the minoxidil market demand. Invasive therapies are generally used for hair loss treatment, but these procedures are expensive, cause discomfort to patients limiting treatment choices. On the contrary, minoxidil product usage is quite consumer friendly and an economic choice for all consumer group types. The product has some side effects over its usage, such as tiredness, dizziness, swelling, and drowsiness. Other serious side effects which can rarely occur are breast pain, nausea, vomiting, itching & burning/redness of the eye, tachycardia, and stiffness in the chest may hinder its usage and can restrain the market growth. 2% Minoxidil market generated over USD 150 million revenue in 2017. Initially, FDA approved concentration of 2% formulation for the hair treatment products as a water-based solution. Topical 2% solution stimulates hair regrowth and prevents severe hair loss among individuals suffering from androgenetic alopecia. Currently, manufacturers are also introducing blends of natural ingredients to keep up with current trends and regulations, as well as to address growing customer demand for safer products. The use of natural oil blends innovation has received more consumer focus owing to the growing preference of natural products over its synthetic counterparts. 5% Minoxidil segment is projected to observe more than 4.5% CAGR from 2018 to 2024. The 5% foam products are the new means of delivery proven to be more effective against androgenic alopecia among men. Eventually, a higher concentration of 5%, was developed based in alcohol and propylene glycol. The commercial 5% formulations are manufactured in this manner to maintain a stable composition. It was observed that propylene glycol was the principal cause of scalp redness, irritation, and greasy hair. To overcome this challenge key company formulated a non-propylene glycol hydroalcoholic solution. The formulation is cost-effective and can be produced on a commercial scale without any noteworthy technical issue. It has a low viscosity and approved by the global regulatory agencies for topical use positively fostering industry share. 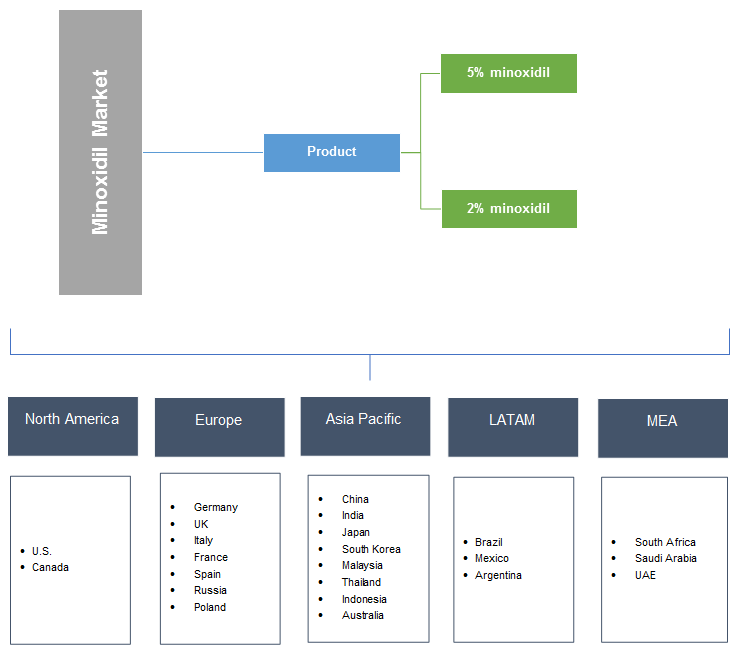 North America minoxidil market contributed more than USD 450 million revenue in 2017 and accounted for the largest share. The region will exhibit significant growth owing to increasing hair fall problems among the young population. Supporting government initiatives, including selling of minoxidil without the need for any prescription is further supporting the regional growth over the forecast timeframe. Increasing patents and regulatory laws supporting the pharmaceutical industry is supporting the regional industry growth. Asia Pacific minoxidil market is anticipated to witness more than 5% CAGR from 2018 to 2024. Increasingly receding hairlines and hair loss owing to multiple factors, including improper eating habits, work pressure, pollution, stress, usage of chemical shampoos, improper eating habits, along with hormonal and hereditary diseases is playing a major role in industry expansion over the projected time frame. China is a key revenue generating the market for prescribed hair loss drugs caused by hormonal deviations. Approximately 21% of men and 6% of women experience hair loss caused by hormonal change. The largest population coupled with growing per capita income is the key factors fuelling the product demand in the regional market. McNeil PPC Inc., Par Pharmaceuticals, and Dr. R. Pfleger Chemical Factory GmbH is among the key dominating players. Other prominent manufacturers are Renata Limited, Nanz MED Science, Pharma Private Limited, and Kumar Organic products. The major manufacturing companies are also opting for forward-thinking strategies, such as utilizing the supplier's help, in staging out unnecessary steps in the production and distribution process. Minoxidil is an antihypertensive vasodilator medication mainly used for the treatment of hair loss cases. It is marketed as a general medication as well as over-the-counter treatment for androgenic alopecia, a form of hair loss, in men and women. It is a growth stimulant compound recommended by experts under the hair loss treatment category. It is a primary ingredient found in major brands and several other hair growths stimulating products. Both men and women affected by pattern baldness can reap its benefits. These major factors positively stimulate the market growth and increasing use of home care products. This medicated solution has widely helped to promote hair growth in men and women. The booming e-commerce industry is also having a positive impact on the minoxidil business. Industry participants are continuously investing in R&D to develop a cream mixed with minoxidil nanoparticles for targeting customers with androgenic alopecia disease. The increasing preference for minoxidil nanoparticles is due to the capability of the nanoparticle to offer improved reaction from the particles compared to a single molecule. Further, the simpler conversion process along with diversified applications further accelerates the product adoption over the projected time frame.